Meghna Bank Jobs Circular 2018 published. Bangladesh Non-Government Meghna Bank limited Career Opportunity 2018 has been published there the official website we are found all information our website. This website we are found Meghna Bank limited Career Opportunity 2018 circular information. Meghna Bank limited is a Bank with the vision to become the leader in financial services in the country by fostering a culture that stresses the highest ethical standard. House building job circular This jobs monthly consolidated remuneration of Tk 35,000/- for the probation period. Who wants to build his career can apply this job circular here. Education Qualification: MBA/MBA/Masters in Banking, Finance, Marketing, Economics, English, Accounting, Management, Computer Science with Honors in Respective subjects. Academic Qualifications: Minimum 02 two first division/classes (minimum CGPA 3.00 out ir 4.00 and CGPA 4.00 out of 5.00 having no 3rd division /class in the academic record. 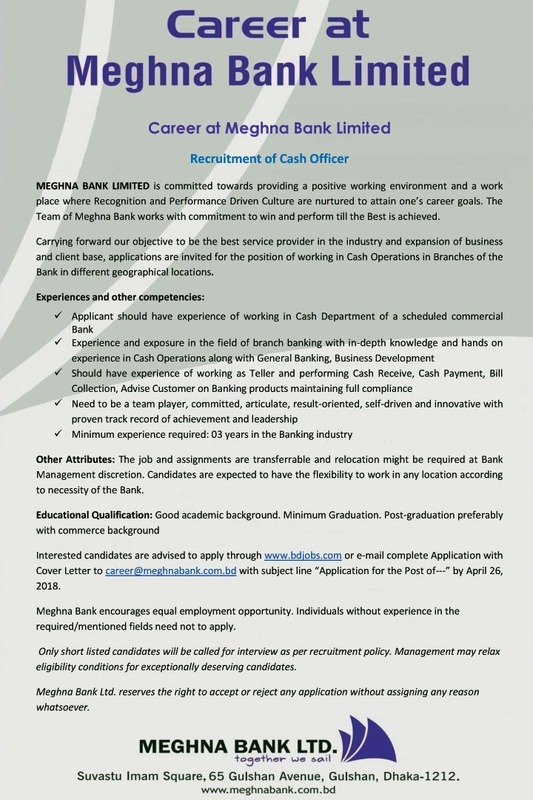 If you want to interested Meghna Bank limited Career Opportunity 2018 you can apply here. Candidates are advised to apply by clicking on the apply now button below. On successful completion of probation period of 1 (one) year and subject to qualifying the prescribed tests, the candidates, will be absorbed as Senior Officer in the Bank. Candidates selected for appointment as MTO will be required to execute a bind for serving the Bank for a minimum period of 3 years including the probating. Thanking to join our website. We have given all jobs information this website.We also published jobs preparation for our Facebook fan page you can like our Facebook page and get more jobs information. This jobs some information copy by Meghan bank official website. To strengthen and enrich our workforce and create future leaders we are going to hire Management Trainee Officers who will share our vision and will execute our mission for sustainable growth and excellence.